How jail-time led to the creation of a writing retreat. It all started when I landed up in prison. It was Christmas eve of 2012. I was living a predictable life and had recently started working for a new employer. Then in a classic corporate accident I was arrested as the fall guy for my employer. My company CEO went underground, and I was imprisoned. Easily the most memorable Christmas of my life. This was in a town called Bokaro, in one of the most corrupt states of India. I kept my chin up. I continued my marathon training, running hundreds of loops in the tiny prison yard. I also started a new vocation — writing. I wrote everyday inside the prison — a sort of diary. There was a hazy dream somewhere that I might try and get it published. After my month-long ordeal, I hadn’t learnt much about writing but I had my first-draft ready. I was released, my name was cleared, and I resumed corporate life. I kept working on my book on the side. Finally, I went to Penguin with it. They asked me to work on it a lot more, but in principle agreed to publish it. In 2014, “The Bad Boys of Bokaro jail” was published. Back then I was proud, but now I cringe when I read it. A couple of years later, the terrible air quality of Indian cities made us rethink our priorities. My wife and I decided we were done with hectic city life. We moved to the Himalayas with our two children. I didn’t want yet another predictable job. Besides, there weren’t any jobs to be found in our little Himalayan village. I wanted to do something I enjoyed. I loved teaching, and I realized that the Himalayas were the perfect place to write. I had the time to be a full-time writer and teacher, but I didn’t know enough about writing. So I became a full-time student. I went on a crash course of style guides and online courses. I blogged incessantly and wrote a lot. I strung together a curriculum of sorts. I asked my friend Roy Abraham to come in and help. A classic adman, he did a brilliant job putting together some compelling videos. We hustled to get the word of the first Himalayan Writing retreat out. We didn’t even have a website. The first surprise was the turnout — six people turned up for the first retreat. The second surprise was when they left — all but one had rated the retreat 5 on 5. As we held more events, we realized that writers at different levels have different expectations from a writing retreat. We started asking applicants to share writing samples, and also digging deeper into their expectations. Speaking to each applicant, reading hundreds of samples, and hosting another six retreats helped our thinking evolve. We developed two separate writing events: the Himalayan Writing Weekend+ and the Himalayan Writer’s Retreat. The Himalayan Writing Weekend+ is for novice writers who want to get their dreamed-of book projects going. This 3–4 day event is heavy on instruction and has full days of sessions. Boot-camp for the new writer. 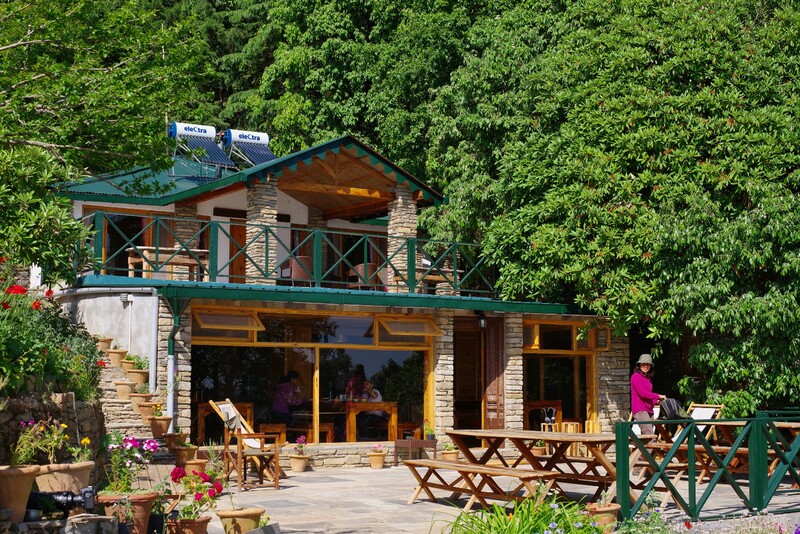 The Himalayan Writers’ Retreat is an event for the intermediate to advanced writer. This seven day event is all about inspiration and distraction free writing. It has few sessions. But we realized that in these few sessions advanced writers need intellectual stimulation and a higher order of guidance. So we invited experienced, award-winning authors to co-host our retreats. The Writers Retreat in 2017 had Mariam Karim Ahlawat as a co-host. Her writing cuts across novels, kids books, and Plays, and she is an awesome teacher. But in both formats, the Himalayas are the secret sauce. Bonfires, stargazing, and forest walks complete the experience. The inspiration from nature and the majesty of these mountains stirs something inside every writer. I know not a better muse. A Himalayan Sunset from the writing retreat venue. We expect to launch a residency program soon, where writers can choose to come and stay for extended periods of time. We also host a blogging retreat from time to time. And our feedback scores stay very near 5/5. And we now have our own website at www.himalayanwritingretreat.com . “The best way to learn something is to teach it.” Goes the old adage. I have learnt an amazing amount from these retreats. I have become a student of writing for life. Repetition of concepts is an excellent reinforcement of learning. And the wisdom of the “dude” authors who come in to co-host the Writer’s Retreat — like Mariam Karim Ahlawat — is incandescent. I had never dreamt of spending days together in the company of such brilliance. And we hope to pull in other stellar authors to co-host future events. I am now finalizing the manuscript of my second book, and I expect it to be much better written. But even if it isn’t, I will be able to analyse it and tell you exactly what is wrong with it. I can certainly do that for my first book. Picture Courtesy: Binsar Forest Retreat. Originally published at www.new-asian-writing.com on September 12, 2017. Chetan Mahajan is an accidental author. He thinks Penguin published his first book because of how sensational the story was — “The Bad Boys of Bokaro jail” was about a month he spent in an Indian jail. Chetan is pretty sure it wasn’t because of the quality of his writing. Since then Chetan has left the city for a small Himalayan village. He has left the corporate world to be a full-time author and blogger. And he has founded the Himalayan Writing Retreat. These retreats are Chetan’s attempt to help others move their book projects forward. In the process he hopes to learn more about writing himself. You can learn more about these writing workshops at www.himalayanwritingretreat.com . Five sources of resilience. In jail and in life.